The Grist Mill - A Volunteer Effort - The recently constructed Franklin Creek Grist Mill is a regional landmark built near the site of the old mill originally built by Emmert and Lahman in 1847. 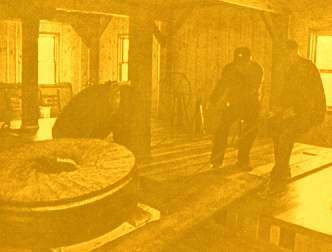 The early American corn meal and wheat flour producing mill was the largest and most complete grist mill in Lee County. The new mill is the only completely water driven operational mill of its type in Illinois. Remarkably, the Franklin Creek Grist Mill was constructed by volunteers who raised hundreds of thousands of dollars and performed thousands of hours of labor. Technology has modernized our world, but the mill and the volunteers are evidence that the work ethics and community spirit of rural America are alive and well. The construction of the new mill began in the fall of 1992. The dedication was held September 25, 1999. Then - Reverand Joseph Emmert and his son-in-law Christian Lahman came from Washington County, Maryland in 1843 looking for natural resources suitable for construction and operation of a grist mill. Their success would be measured by their ability to combine hard work with creative use of abundant resources such as water, wood, and soil. Surprisingly, they selected a mill site a half mile from their water source. Their project required excavating a long raceway and a mill pond. The location required a tremendous amount of earth moving accomplished by horse power and hand shovel. The builders chose the site because of its accessibility by customers and the virtual elimination of flood and ice damage. Although the mill changed hands several times over the years, it was operated until about 1896 when the decreased water flow caused it to be abandoned as a mill. Now - The new mill affords the visitor the complete experience, hardly possible at an old mill. Visitors can experience nineteenth century heavy-timber type construction, and also, meet and visit with the mill builders and operators. The 4-ton wheel located outside the mill is driven by water from the 2-1/2 acre spring fed mill pond. The turning of the wheel powers a bull gear located in the basement which turns the pinion gear driving a series of belt driven pulleys which transfers power to a vertical shaft to turn the runner stone for grinding on the first floor. Displays and learning activities on the second floor include walls paneled in wood from 43 different species of trees. The Learning Center on the third floor details the story of the construction of the mill with a scale model of the current structure.